1. To make the sauerkraut: A week in advance, using a very clean bowl and hands, shred the cabbage, add probiotic starter and salt then massage it into balls consistently until all the liquid has leaked out (this should take 20 minutes or so). Scrap all the filling together and press under the liquid, add a little water if need be and leave in a warm place (about 38c) overnight, then refrigerate until required. 2. Preheat oven to 180 degrees. 3. Blitz the plums and spices for the char sui and marinade the turkey breasts for 2 hours, set aside. Then place the turkey on a baking tray and place in the oven until tender. 4. 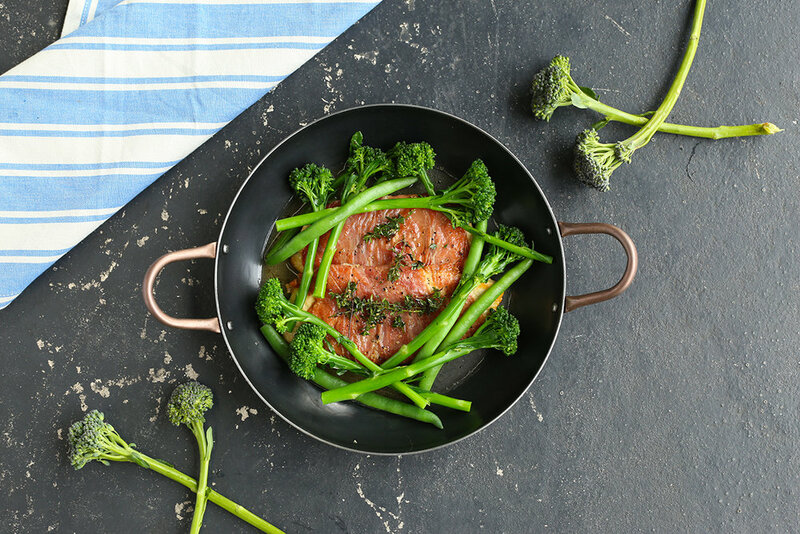 Heat a pot of water over a high heat and blanch the broccolini for 3 minutes, or until just tender and set aside. 5. To serve: Place the sauerkraut on the bottom of a suitable serving bowl, serve the turkey on top and broccolini around.